Hi! 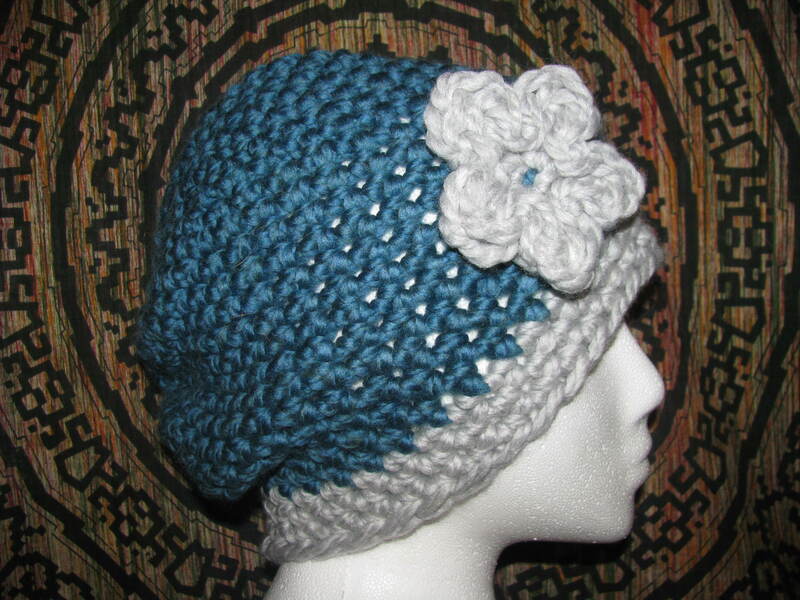 My name is Julie Tribble, and my shop is called Stella Blue Handmade. I am currently living in Catonsville, MD, a historic little town just outside of Baltimore. I love to create a lot of different things, but right now my shop mostly contains handmade beaded jewelry and crochet accessories. It started with making jewelry for fun and for myself because I could never find anything that was exactly what I wanted, and eventually I had amassed a big enough collection that I knew I could never wear them all! 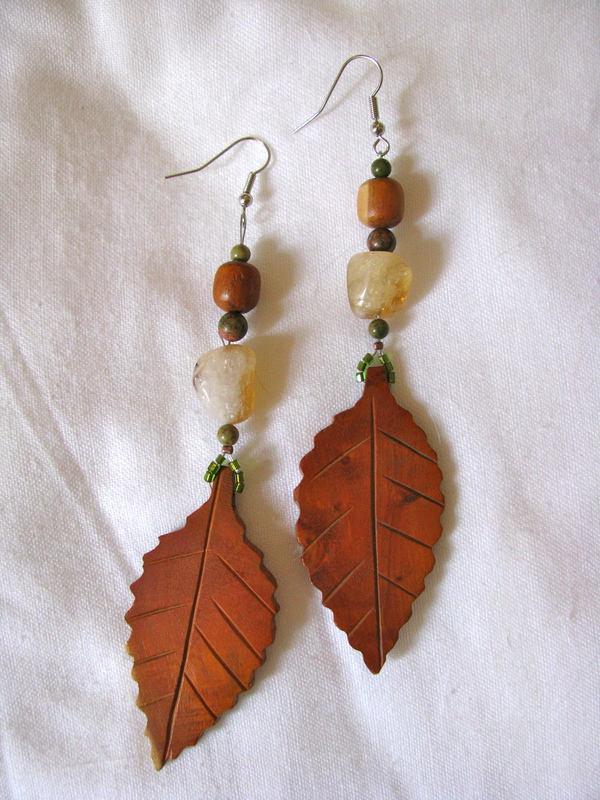 When I started selling my creations, it was so exciting to find that other people loved what I was doing too. I would say my purpose for Stella Blue is to create unique wearable pieces of art that reflect my love of nature, music, color, and the earth. My creative process usually first involves turning on some music, sitting in my craft room, and staring at my pretty massive bead collection until a certain bead or color grabs my attention. Then I choose a few more beads that compliment the first, and come up with a basic plan in my head. From there on out I just improvise with different patterns until I find one I like, and kind of just go with it. Sometimes it doesn’t turn out exactly like I had in my head, but that’s ok. 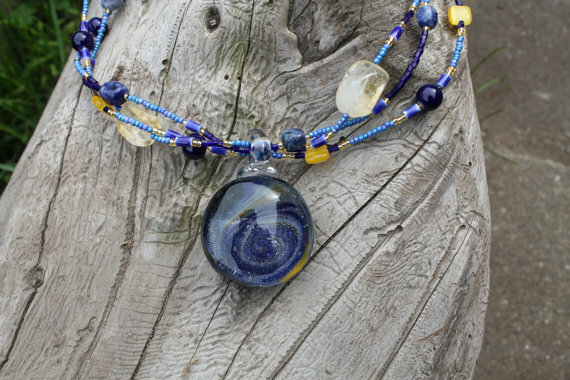 I like seeing how the different shapes, colors, and textures of the beads all come together in the final piece. My bead collection is a mixture of new and recycled beads. Some of my beads are bought from wholesalers or at retail stores, but a lot are from old pieces of jewelry that were broken or weren’t being worn anymore. 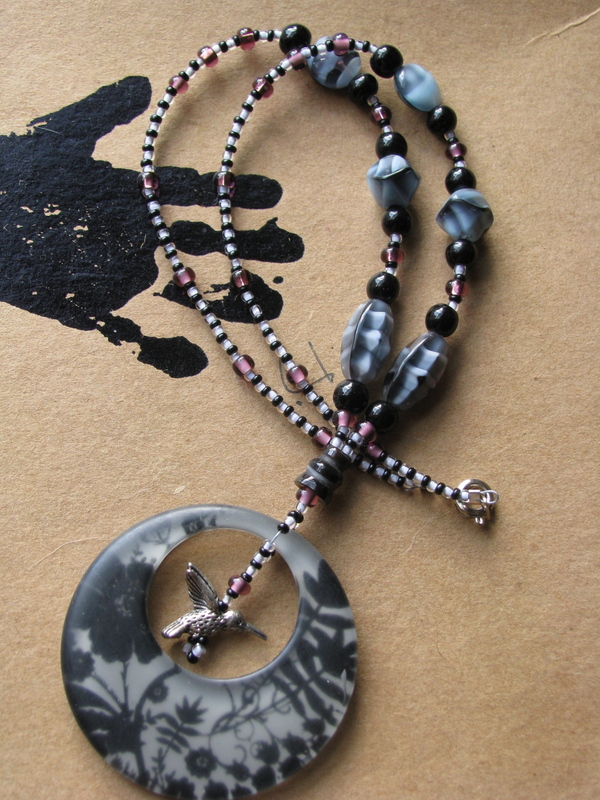 I deconstruct the jewelry and add the beads to the collection, then I can create new one-of-a-kind pieces. I love recycling and giving new life to old treasures. The crocheting started a few years ago, and has been my recent obsession. I took a class at Lion Brand Yarn Studio and just kept teaching myself from there. My favorite things to crochet are hats, long infinity scarves, and fingerless gloves. I even made my boyfriend a beard this past winter. Pretty much everything I crochet ends ups being from my own pattern or variation of a pattern. I also like to check out new stitches and patterns in books or online to get different ideas. Lion Brand has a TON of free patterns and even illustrations and videos of stitches on their website, so I find myself turning there if I run into something I don’t know how to do. It’s been a fun process, and I am constantly learning more. All throughout my childhood I took various art classes; my favorites were drawing, painting, and photography. I studied interior design at Parson’s in New York City, and ended up living there for just over 6 years. I was very inspired by the city and the people I met there, despite the fact that I always craved the solitude of the woods and the beauty of nature. I worked at the coolest coffee shop in the East Village, and was surrounded by so many amazing artists and musicians. I was creating more than ever, and it was then that I decided to start Stella Blue Handmade to sell my crafts. 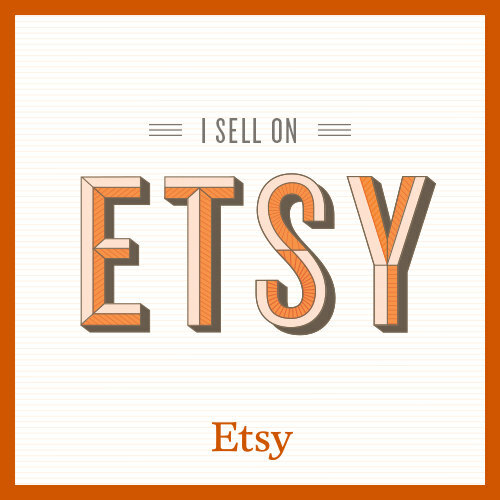 I opened the Etsy shop, and started booking some local craft shows. I have pretty much always had a day job (but they’ve all actually been pretty cool), so the crafting is something I do in my spare time. I figure it’s something I’m going to do anyway because I love it, so it gets as much or as little time as I’m able to give at that point. Currently I am working my first 9-5 job (ever!) but it’s kinda nice because I can spend some evenings making things, and I’m able to book local craft shows on the weekends. For as long as I can remember, my mother was always teaching and encouraging my sister and I to make things, so I’m sure that’s where my passion comes from. As a kid I loved drawing, painting, sewing, woodworking, redesigning my bedroom, making jewelry, collages, candles, and so much more. I think the first time someone else’s handiwork really stood out to me as a child was seeing all the amazing things my Grandmother made. She could sew, knit, crochet, and quilt better than anyone I’ve ever seen, and I will never understand how she made the intricate designs and perfect stitches. I now have her collection of fabric and sewing supplies, and sometimes the mood will strike me and I’ll sew something up. I like using all her old supplies, and my mother’s too. They’ve both passed away and when I think of them as I’m making things I feel like I’m continuing a tradition, and a part of them is there with me. 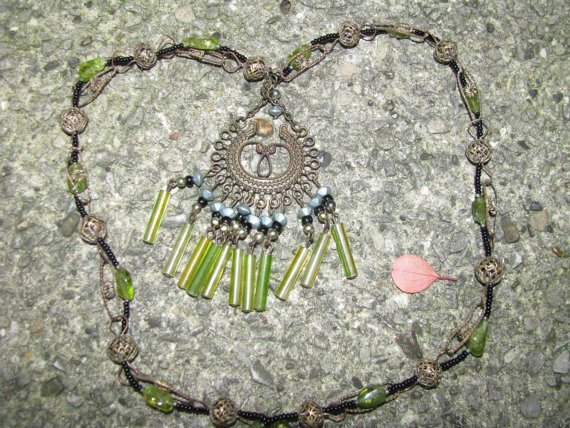 I would say my favorite piece in the shop right now is a long pendant necklace in green and black with vintage metal beads. The large pendant used to be an earring, and the metal beads are from a very old necklace that a friend gave me. 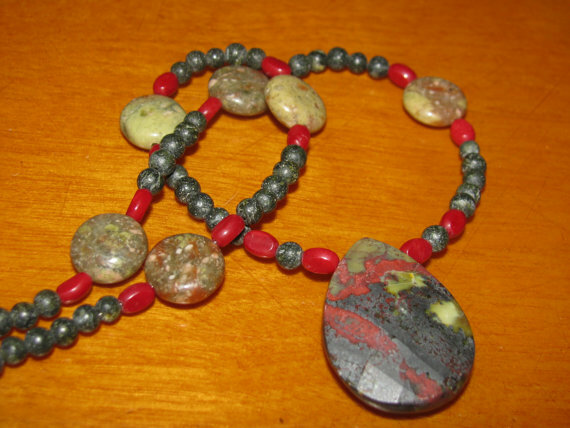 I mixed those with a strand of seed beads, and bright green accent beads. I love that these random parts all come together to create a new, unique piece and can’t be duplicated. Some of my other favorite pieces I’ve recently made are probably the collaboration pieces with fellow Deadhead Art Alliance members. Our Cap’n Jen made a few glass pendants (one glows in the dark!) and shipped them across the country to me. 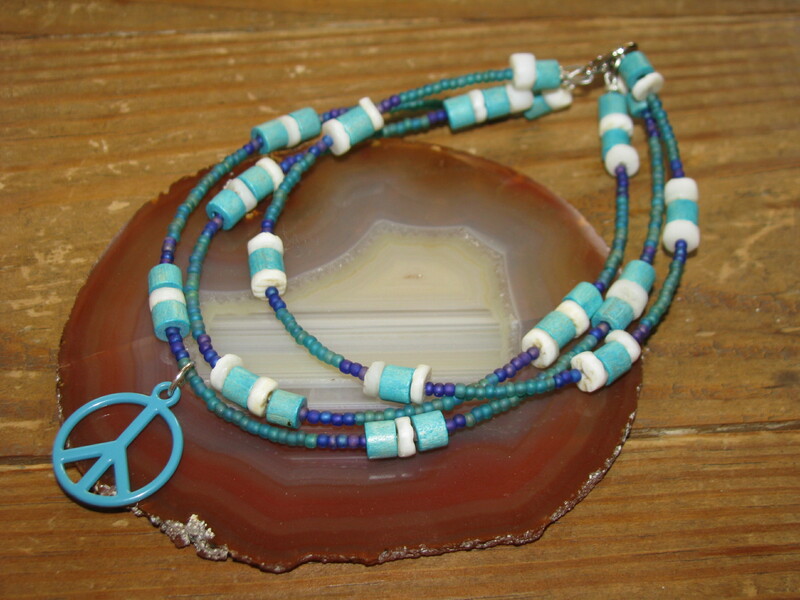 I then worked them into one-of-a-kind beaded necklaces and shipped them back to her to be sold in our team Etsy store. 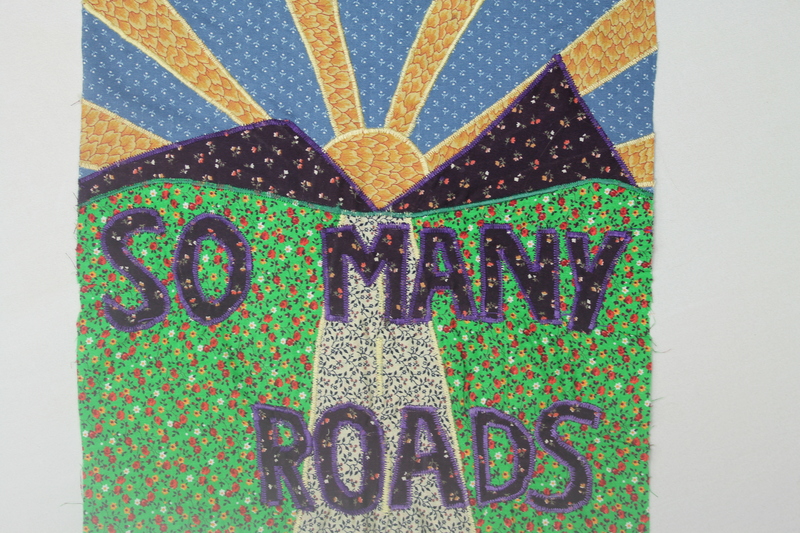 I also love that I didn’t completely slack off on contributing to our team collaboration quilt. I think I made the square like 2 days before I needed to mail it to meet the deadline. But I’m so glad I did because when I saw all these little random pieces of art come together as a finished quilt, I was SO proud to have been a part of it. It’s so awesome to see your work combine with others to create something more than you thought it could be. I find I draw inspiration from a lot of different places. Nature is a big one; I feel refreshed and more creative after I spend some time in nature. I love seeing different color combinations, or different materials interacting, and the feeling of peace I get just being in the woods or at the ocean. I am also definitely inspired by music and music festivals. I go to at least one big camp-out music festival every summer, and as many local shows as I can get to, and after each one I find a new burst of inspiration. I love being surrounded by so many like-minded people who are so creative and unique as well. My travels are also a big inspiration; I always find time to browse the local craft/art scene. I really enjoy seeing other people’s arts and crafts, and love supporting independent artists. You can always tell when they’ve put their love and passion into their work. The parts of running Stella Blue that I love most are definitely making the pieces, but I also love working festivals or craft shows to sell my work. I love talking to people at my booth, and I truly appreciate them looking or complimenting, even if they don’t buy anything. Just hearing them say “oh, that’s so pretty!” makes my day. Probably my favorite is when they’re checking something out, decide to think about it for the day, and then they have to come back for it. I also do love buying the beads, yarn, and supplies. I can’t go into craft stores too often; I see so many things I want to make that I end up buying more than what I came in for. When I lived in Manhattan, I went to some jewelry wholesalers where the boxes were haphazardly stacked to the ceiling (literally) and you just had to kind of rummage through to find what you wanted. It was really fun! Because I don’t depend on making money from my craft to pay my bills, literally every single sale excites me. I guess it’s simpler that way 🙂 But, the hardest time I can remember with Stella Blue was the first outdoor festival I was vending at. It was a sunny and very, very windy day in June, and I was perfectly positioned on a hill where the wind violently gusted through every 5 minutes. I was trying to set up my booth and things were blowing everywhere. Luckily, I had my amazing MacGyver-like boyfriend helping me set up and we had a spool of fishing line. He literally tied down everything in my booth with an elaborate network of fishing line. It took at least an hour and a lot of adjusting, but we were able to secure the tent and everything in it well enough for me to feel comfortable with him leaving and me being there alone until my friend came by later. If he hadn’t been there that morning, I don’t know how I would’ve had the patience to beat that damn wind! And I have to add that my friends are amazingly encouraging. There’s the friend who met me at that same windy festival later in the afternoon with a 6-pack of beer, the one who has gotten her salon to sell some of my jewelry and crochet, and the friend that just talks about my crochet in the winter at the bar and drums up business for me, just to name a few. They all get me through the hard times, and I’m so grateful! This quote stood out to me when a friend wrote it down for me just before I left on a 3 month solo road trip around the country. It kind of validated this desire I had to do this trip even though some people probably thought it was a crazy idea, and sometimes I wondered if it was. But the amazing experience fed the free, adventurous, independent side of me when I needed it the most, and I am so thankful for it now. I would have to say the first camping music festival I went to definitely changed my life. It was All Good 2005, and although I had been going to concerts since I was a kid, this was my first camping festival experience. It was so cool to see thousands of people coming from so many different places, converging on this beautiful mountaintop to celebrate music and peace. I felt like I could truly just be myself, and it was inspiring to be around so many other creative people. Since then, I have made it a point to go to as many of these festivals as I can get to each year. Needless to say, our first campsite was pathetic compared to what it is now. Each year we’ve added another cool feature or convenience, and now we have pretty much the coolest campsite at the festival (I think!). But I’ve found nothing beats the feeling of dancing to some amazing music outside in a beautiful setting with a whole bunch of other positive and happy people. I guess just that I really love making things! I’m always going to be making something; it just makes me happy. And I think it’s a bonus if other people can appreciate and find joy in my work as well. I plan on constantly expanding my store. I am always making new things, depending on when the mood strikes me, so I’m always adding new sections. I recently made some 20’s flapper style feather headbands, and have been working on a lot of new crochet items for the fall. I have also been sewing lately, and working on things to add to the store. It’s a constant work in progress, which is a good thing and a bad thing sometimes. I always feel like there’s more to do, it’s never going to be complete. But, I guess that’s just part of the fun..